Ground Zero Coffee™ available for purchase - Coming Soon: a great online store where you can get your hands on coffees. This is no ordinary bean - it's Artisan Roasted: Ground Zero Coffee is carefully gourmet roasted by experts with years of quality roasting expertise that takes coffee flavor to a higher level. We're talking Arabica Specialty Grade - the best there is - hand picked at private coffee growers, not machine harvested, so it's all coffee, no "bits and parts." Moon Doggie Coffee Roasters does their own roasting (NO rancid beans that were on the shelf for months). This is no ordinary coffee...honest. We have tons of roasts and blends of coffees available. We're offering a couple of popular French roasts here that we think are superb. Give 'em a try. Love coffee, but you're not into the caffeine? Try the decaf! Fat Man French - 20-megaton blast! All the caffeine you want, a flavor that is surprisingly smooth, and a chocolatey finish. Official Ground Zero Alert Level: SEVERE. 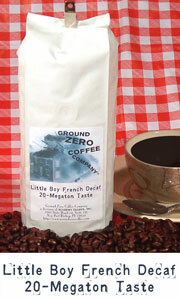 Little Boy French Decaf - 20-megaton taste! Great smooth taste, without the kick in the pants! Our friends at Moon Doggie use only the Swiss Water Process or Royal Select Water Process (no chemicals here!). Enjoy great coffee taste, without the caffeinated guilt! Official Ground Zero Alert Level: LOW. Try all the great Artisan-grade coffees by our friends at Moon Doggie Coffee Roasters! Light to dark roasts, decafs, flavored coffees, plus great swag like t-shirts, thermal coffee mugs, and coffee accessories. Cheap TV Spots®: award winning TV ads & targeted air time - advertise your site on TV! What are "Fat Man" and "Little Boy"? "Little Boy" was the military codename of the atomic bomb dropped on Hiroshima, Japan, on August 6, 1945 from a USAF B-29, dubbed the Enola Gay. It was the first atomic bomb ever used as an offensive weapon. "Fat Man" was the name of the much larger atomic bomb detonated over Nagasaki, Japan by the United States, on August 9, 1945. Japan officially surrendered on August 15th, 1945. The end of WWII ushered in an era of unprecedented productivity and prosperity in the West, that eventually spread to the East and across the globe. 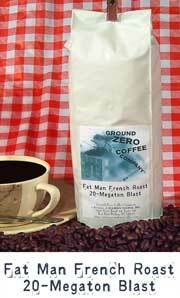 So, let's all have a fresh, hot atomic blast of Ground Zero Coffee to start our productive, prosperous day. JAPANESE NUKES? - In case you're wondering, yes, it seems the experts (well, the legion of ghost writers on Wikipedia) are saying that around the same time as the cosmoplitan-sounding U. S. Manhattan Project, the Empire of Japan was trying to develop a genshi bakudan - an atomic bomb. Most experts believe Japan didn't get too far. The program was small, and never managed to make a working nuke. (Of course, had they managed to build it first, no doubt they would have used it.) The surrender of Japan put a halt to all further development on the weapon. Now, all we need to worry about are Algeria, Argentina, Australia, Brazil, Canada, China, France, Germany, India, Iran, Iraq, Israel, Italy, Netherlands, North Korea, Pakistan, Poland, Russia, South Africa, Taiwan, and the United Kingdom. And little 8-year-old Skinhead Tommy in his basement with his chemistry set. 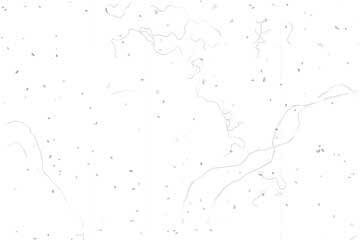 copyright 2006-2019, Academy Leader, Inc.